Tetrahydrocannabinol (THC), or more precisely its main isomer (trans-Δ9-tetrahydrocannabinol) , is the principal psychoactive constituent of the cannabis plant. All cannabinoids activate two specific GPCRs known as the CB receptors CB1 and CB2. The CB1 receptor is abundant throughout the CNS and is particularly abundant in specific regions of the brain, like hyppocampus, cerebellum and basal ganglia. The CB2 receptor is found on leukocytes and in the spleen, thymus, bone marrow, and other tissues associated with immune functions. As with other Gi-linked receptors, the activation of CB1 or CB2 typically blocks the activation of adenylate cyclase, preventing signaling through cyclic AMP. In the neuronal synapse,cannabinoids like THC or 2-AG (2-arachidonoylglycerol), an endocannabinoid created by neurons, act in a retrograde fashion. Infact, 2-AG is synthesized and secreted by post-synaptic neurons and activate CB1 receptors at the presynaptic axon terminal. Activation of CB1 then modulates signaling within the presynapse, producing either a transient or prolonged reduction in the release of neurotransmitters.This mechanism is called presynaptic inhibition. Activated CB1 receptors couple to Gi/o-protein to inhibit adenylate cyclase, decrease Ca2+ conductance, increase K+ conductance, and increase mitogen-activated protein kinase activity. The presynaptic localisation of CB1 receptors indicates that cannabinoids modulate neurotransmitter release from axon terminals. The effect of cannabinoids on synaptic function consists of inhibition of the release of a variety of neurotransmitters and also the inhibition of electrical activity by a depolarisation phenomenon. For example, in the hippocampus, CB1 receptors are more abundant on inhibitory γ-aminobutyric acid (GABA) terminals than on excitatory glutamate terminals. 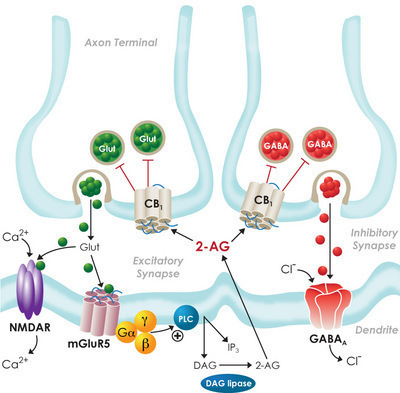 Activation of CB1 by 2-AG on pre-synaptic terminals strongly decreases the release of the inhibitory neurotransmitter GABA and less effectively reduces the release of the stimulating glutamate. Partial inhibition of glutamate signaling is sufficient to effectively limit the synthesis of new 2-AG while old 2-AG is inactivated by MAGL. It occurs both in cerebellar, inhibiting the release of Gaba, and in cortex, inhibiting the release of glutamate: this two inhibitions are important for the THC effects on mind and on body. Stronger inhibition of glutamate signaling, as may occur with overproduction of endocannabinoids or an intake of THC, may impair hippocampus-dependent learning and memory. Through its many variable effects on several different types of neurotransmitters, CB1 signaling confers additional plasticity in neuronal signaling. Firstable we have to analize and focused on the different parts of the cortex where CB receptors are expressed and where THC binds most. An experiment done in 2012 by Atakan Z. and his equipe shows us, through a functional RNM, the parts of the cortex activated by THC in a group of volunteers. Cannabis affects people differently: inter-subject variation in the psychotogenic effects of Δ9-tetrahydrocannabinol: a functional magnetic resonance imaging study with healthy volunteers, 2012.. The present study is the first to demonstrate neurobiological differences that may contribute to the differential sensitivity to the psychotogenic effects of cannabis in healthy participants. These findings imply that there is an association between individual variability in brain response and subsequent transitory psychotic symptom formation. They used functional magnetic resonance imaging (BOLD) to investigate differential response to oral THC in a group of healthy, seldom cannabis users and compared the behavioural and imaging findings of those who developed transient psychotic symptoms (*TP group*) with those who did not (*NP group*), and those who take a placebo. There was a significant interaction between the effects of drug and group in the left parahippocampal gyrus (PHG), medial temporal gyrus (MTG), superior temporal gyrus (STG) and in the region spanning the right cerebellum and adjacent fusiform gyrus. In all of these regions, relative to placebo, THC significantly attenuated activation in the TP group, whereas it increased it in the NP group. The equip also found significant differences between the two groups in the effects of THC in the left PHG, STG, MTG and cerebellum, where THC decreased activation in TP group, but increased it in NP group. In the right MTG the reverse happened; THC increased activation in the TPs and decreased it in the NPs. In this demonstration of inter-subject variability in sensitivity to the psychotogenic effects of THC,they found that the presence of acute psychotic symptoms was associated with a differential effect of THC on activation in the ventral and medial right temporal cortex and cerebellum, suggesting that these regions mediate the effects of the drug on psychotic symptoms. Users of cannabis often report to have bright ideas during their trip or to remember and link some past experiences that they have never think about. They often report to have a looser mind and to use the brain in a different way. This sense of jumping from an idea to another and to have a more "artistic" point of view is linked to the neurobiology of the insight. The Neuro Psychologist Professor Narinder Kapur use the expression ‘Paradoxical functional facilitation’ to describe a situation in which the loss of activity (e.g. due to a damage, or a temporary loss, such in this case), leads to an improvement of other specific functions. A paradigmatic example is carried by the cases of ‘les idiots savants’. This peculiar syndrome in characterized by autistic-like symptoms shuffled with incredible abilities in mathematic calculi or music field. (Oliver Sacks-the twins-). In our case the inhibition leads to an increased activity in the right hemisphere anterior superior temporal gyrus. People sometimes solve problems with a unique process called insight, accompanied by an “Aha!” experience. It has long been unclear whether different cognitive and neural processes lead to insight versus noninsight solutions, or if solutions differ only in subsequent subjective feeling. Recent behavioral studies indicate distinct patterns of performance and suggest differential hemispheric involvement for insight and noninsight solutions. Subjects solved verbal problems, and after each correct solution indicated whether they solved with or without insight. We observed two objective neural correlates of insight. The porpouse of this study, done by Mark Jung-Beeman and John Kounios, is to test the empirically and theoretically derived hypothesis that solving problems with insight requires engagement of (or increased emphasis on) distinct neural mechanisms, particularly in the RH anterior temporal lobe. Event-related experimental designs compared neural activity when people solved verbal problems with insight to neural activity when they solved problems (from the same problem set) without insight. Subjects saw three problem words (pine, crab, sauce) and attempted to produce a single solution word (apple) that can form a familiar compound word or phrase with each of the three problem words (pineapple, crab apple, applesauce). We relied on solvers' reports to sort solutions into insight solutions and noninsight solutions, avoiding the complication that presumed insight problems can sometimes be solved without insight (Davidson JE. Cambridge, 1995. The suddenness of insight) and circumventing the use of different types of problems requiring different cognitive operations. The study is focused on two experiments: FMRI (Experiment 1) should reveal neuroanatomical locations of processes that are unique to insight solutions, and EEG (Experiment 2) should reveal the time course (e.g., whether insight really is sudden) and frequency characteristics of neurophysiological differences. Functional magnetic resonance imaging revealed increased activity in the right hemisphere anterior superior temporal gyrus for insight relative to noninsight solutions. The same region was active during initial solving efforts. This experiment illustrates the most robust insight effect: as predicted, insight solutions were associated with greater neural activity in the RH aSTG than noninsight solutions. The active area was slightly anterior to primary auditory cortex, posterior to temporal pole, and along the medial aspect of the aSTG, extending down the lateral edge of the descending ramus of the Sylvian fissure to midway through the middle temporal gyrus (MTG). A Voxels showing greater FMRI signal for insight than noninsight solutions, overlaid on the averaged normalized structural image of all subjects. B and C Group average signal change following the solution event, for insight (red line) and noninsight (blue line) solutions (yellow arrow indicates button press): B over entire LH aSTG region;C over entire RH aSTG region. D Insight solution signal change minus noninsight solution signal change, in RH aSTG (error bars show the standard error of the mean of the difference at each timepoint). (A) Voxels in right temporal lobe showing baseline-to-peak event-related FMRI signal when subjects first encounter problems, overlaid on the averaged normalized structural image of all subjects. The cluster is in RH aSTG, with a volume of 469 mm3, with peak t value of 4.37 at 41, −6, −12 in Talairach space, clearly overlapping with the cluster showing an insight effect at solution. (B) Group average signal change following problem onset (time = 0), for the cluster defined by signal at the problem onset (green line) and the cluster (illustrated in Figure 2A) showing the insight effect at solution (white line). Error bars show the standard error of the mean of the difference at each time point. Scalp electroencephalogram recordings revealed a sudden burst of high-frequency (gamma-band) neural activity in the same area beginning 0.3 s prior to insight solutions. This right anterior temporal area is associated with making connections across distantly related information during comprehension. Although all problem solving relies on a largely shared cortical network, the sudden flash of insight occurs when solvers engage distinct neural and cognitive processes that allow them to see connections that previously eluded them. We have seen, thanks to FMRI studies, that THC activates the same part of cortex in the right anterior superior temporal gyrus (aSTG), related to the insight and this is why cannabis users report to jump from an idea to another and they report to link each others some experience and some past facts. Addictionally, THC improve artistical and creative skills according to the activation of parts of the right cortex: it's a fact that artists from past usually uses cannabis or other drugs to reach a sense of peace and sense of tranqullity that could help them to perform their talent. But is the unconscious part, not the conscious, part of our mind involved in the insight, in the artistic perception and in cannabis use. "If an action is determined in the brain before it is consciously chosen, where is our “free” will? The latest research suggests that our sense of willing a movement is only an illusion, an ex post facto rationalization of an unconscious process, much like the relation of feeling to emotion. Can our choices be made freely, even if not consciously? Does the conscious decision have any causal relation to the act itself?" We don’t know exactly what roles the unconscious plays in complex cognitive operations. However, the idea that unconscious mental processes can deal with several items simultaneously in an orderly and coherent fashion while our conscious attention can only focus on a limited amount of information has led Ap Dijksterhuis, a Dutch social psychologist, to propose an interesting notion:*unconscious thought and conscious thought differ in important ways in our decision making*. Dijksterhuis follows Freud in believing that conscious thought represents merely a sliver of the brain’s overall processing power. Moreover, while it may be superior for simple, quantitative decisions with only a few possible options, like figuring out highway directions or solving an arithmetic problem, conscious thought becomes quickly overwhelmed in complex qualitative decisions with many possible alternative solutions, like choosing what car to purchase, changing careers, or aesthetically evaluating a painting. This is because consciousness recruits attention, which can only examine a small number of possibilities, often one at a time. In contrast, unconscious thought comprises a vast web of autonomous, specialized networks throughout the brain that are capable of dealing with a number of processes independently. Dijksterhuis, in his study,argues that because a great deal of memory is unconscious—namely, procedural memory for perceptual, motor, and even cognitive skills—unconscious thought is superior for decisions that require comparing many alternatives simultaneously. Dijksterhuis argues that unconscious thought works in a non-hierarchically way, and may therefore allow more flexibility in finding new combinations and permutations of ideas. While conscious thought processes integrate information rapidly to form an occasionally conflicting summary, unconscious thought processes integrate information more slowly to form a clearer, perhaps more conflict-free feeling. Libet used as his starting point a discovery made in 1964 by the German neuroscientist Hans Kornhuber, who asked volunteers to move their right index finger, registering brain activity with an EEG. Kornhuber found that, invariably, each conscious movement was preceded by a little blip in the electrical record from the brain, a spark of free will! He called this potential in the brain Bereitschaftspotential (readiness potential) and found that it occurred a little less than one second before the voluntary movement. Libet followed up on Kornhuber’s finding with an experiment in which he asked volunteers to lift a finger whenever they felt the urge to do so. He placed an electrode on each person’s skull and confirmed that a readiness potential fired a little less than one second (1,000 milliseconds) before the person lifted his or her finger. Libet then compared the amount of time that elapsed between the person’s willing the movement and the occurrence of the readiness potential. Amazingly, he found that the readiness potential appeared not after, but 800 milliseconds before a person felt the urge to move his or her finger! Thus, merely by observing the electrical activity of the brain, Libet could predict what a person would do before the person was actually aware of having decided to do it. These studies were advanced in 2011 by the neurosurgeon Itzhak Fried and his colleagues at the University of California, Los Angeles, who studied the brains of patients undergoing operations for epilepsy. They found that the firing of a relatively small group of about two hundred fifty neurons in our brain predicts the will to move. This finding is consistent with the idea that our feeling of volition may in fact be simply a readout of activity in the brain areas that control voluntary action.